On Sunday I went to the grocery store and spent a bundle; shopping just the outer spaces of the store. At the same time, Brian went to Sam’s Club and bought “the big stuff” that we go through like water. Cheerios and milk especially. The house was stocked full. When Grace looked in the cabinet yesterday afternoon she had a total meltdown. There was no sugary cereal. No candy in the cabinets. No ice cream. No empty carbs. “But you can have an apple or a pear or a banana?” I said. “What about a cup of milk? A grilled cheese sandwich? Leftover noodles with zucchini from last night? A turkey roll? She turned on the waterworks. “I just don’t know!” She cried. But she did know. She has gotten used to Swedish Fish and Bugles as a snack. There was comfort for her in knowing there would always be a box of Fruity Pebbles or cookies in the pantry. It was an epiphany for me. As a mom in charge of feeding these little humans I realized how my own food choices and mindless (read easier, here have some processed sugar) purchases have affected my children. All of the foods I offered are things that are readily available in our kitchen, so they’ve ben exposed to the good stuff, but they’ve gotten used to the processed things that I’ve also bought (too often) for our house. As is everything in life, this move toward a healthier existence is a process. I am forty and am beginning the battle a little bit late. For the children I hope I can turn around their habits for a lifetime of better (healthier) food choices resulting in strong bodies, good self images and satisfaction from the consumption of a juicy pear over an empty bowl of Lucky Charms. Healthy Foods. These created by artist/photographer Carl Kleiner. Grilled cheese and banana ice cream cone. 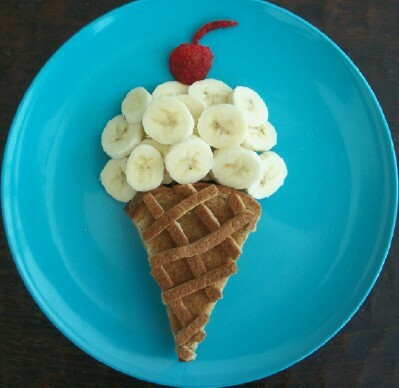 Image (and lots of other cute food ideas for kids) at http://www.sixsistersstuff.com. Endamame. I had a bags of these in the freezer, but forgot about them! My kids love endamame! It’s easy to write what you know, but what about the things you don’t? What about the things that confuse you? Journaling is supposed to be a way to figure stuff out. Blogging is like journaling, except when you finish, you don’t hide your words in a drawer. There is one subject I can’t write about; food. I have spent my entire morning writing and trashing posts about it. I went back to look over the three food posts I’d written before, and without a doubt, I like them the least. My relationship with food is complicated. This I know. A little while ago I went upstairs to make sure Brian was awake. He asked me where his cords were, since I am in charge of laundry in this house. I had folded them in the closet when I couldn’t find a hangar, so I pointed them out and came back downstairs. When he appeared just now, in his khaki pants, I asked what happened to the cords. I think it’s amusing that I’ve been pondering the issue of weight and food all morning and this is my first adult conversation of the day. I told him that it’s Winter. I always put on some weight this time of year and it always comes off in the Spring. Whether it’s because of the foods we choose to eat, or our bodies holding onto excess weight (in the cold) like cavemen used to do, I’m not sure. That’s a lie, the cake and ice cream I ate during last night’s (DVR’d) Boardwalk Empire surely has something to do with it. My relationship with food may never be understood and I may never be able to write an inspired piece about it. I may wake every morning for the rest of my life committing to making good food choices, but only succeed some of the time. It’s possible that this might be the most inspired I ever get on the subject. Since I know it, I can live with it, which makes it all okay. You are currently browsing entries tagged with food choices at Running in Mommyland.